I have 2 jet skis for sale with double trailer. 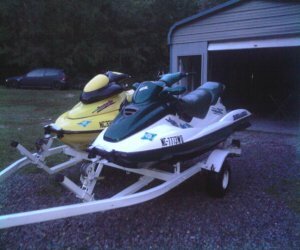 One is green & white Its a 1997 GTX Seadoo Bombardier Its 10 feet 3 inches long Its a 3 seater One is yellow Its a 1997 5662XP Bombardier Its 8 feet 9 inches Its a 2 seater I have life jackets & a pull behind tube to go with this also. They both run great.